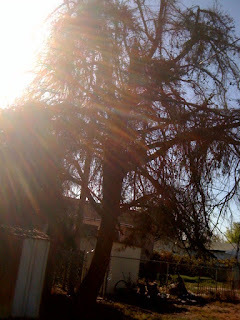 We had this HUGE tree in our backyard. It was always messy but it was pretty and provided a ton of shade before it DIED. So not fair!! 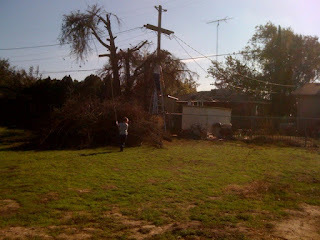 I tried to get PG&E to come out and top it since the power lines ran through it but they wouldn't since it wasn't touching the highest lines. BUMMER! 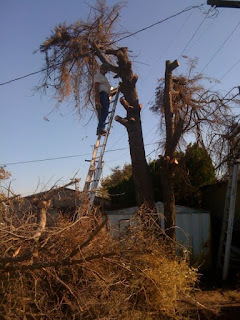 My retired (but not old lol) neighbor volunteered to cut it down and when I came home from work the other day he was almost done topping it off! 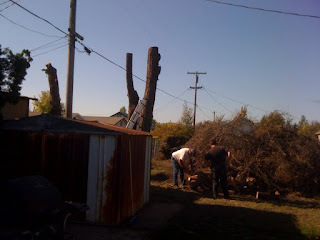 The branches were a huge gnarled mess. He got everything cut off but the stumps (they are still probably 10 feet tall). I think he might be done since he didn't come back today. I'm going to get him a gift card to somewhere, I'm thinking the Bass Pro Shops for all his hard work! 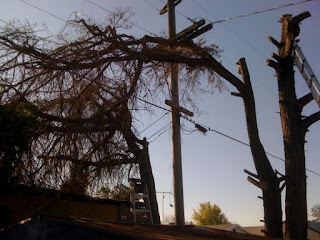 Also called a few tree service places but so far no calls back. We'll see how much they will charge to get rid of it all. 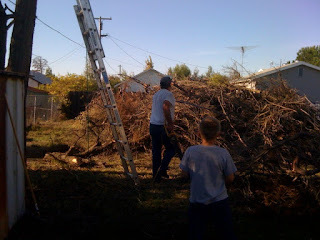 I think it is going to be way too much work to try and take it all to the dumps ourselves.